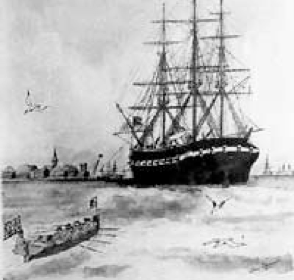 In 1700, Jean Pierre Bondurant found his way to London, England and boarded the ship Peter and Anthony bound for America. On 20 September, 1700, the ship arrived at Jamestown, VA and the new arrivals were taken up the James River to the shoals (present day Richmond, VA). They settled initially in Manakin Town, a deserted Monacan Indian village.